Premarital counseling is far cheaper than a divorce and much cheaper than an all-day wedding reception. A research project cited in Family Relations (April 2003) reviewed 23 studies on the effectiveness of premarital counseling and found that the average couple who participates in a premarital counseling or education program reports a significantly stronger marriage than other couples. Why they want to marry each other? What is it about this person that makes you want to spend the rest of your life with him/her? These two questions can expose their own value system. Their answers can help counselor to understand about what they want in a spouse than it tells about the person they love. Their descriptions expose their core affections, the foundational building blocks of true intimacy. These early descriptors are the windows into the soul of the other. Marriage is a life-time discovery. They must feel safe and satisfied in being together. Pausing to question these feelings may be a warning sign of trouble ahead. They must be able to share deeply from the heart, to feel truly themselves with each other, assured that they are accepted for who they really are, not as someone they pretend to be, or their partner imagines them to be. They must know each other as completely as possible in order to love one another. They must be able to demonstrate that their partner’s wellbeing is as important as their own, that love is mutual and requires picking up the slack without measuring. They need to understand that love is a quality, not a quantity. They must share a common value system while keeping an open mind to examine things from their mate’s viewpoint. They must be able to grant concessions, providing it does not compromise their value system. They must respect that a good marriage depends on an adequate frustration tolerance level. It is important to alert the couple that because of their intense feeling they may overlook important characteristics of each other and may attribute certain valued qualities to their mate, but they need proof before facing the challenges and impact marriage will inevitably have on their lives. Counselors/Pastors should encourage couples to begin the premarital counseling before becoming engaged, thus leaving them plenty of time to deal with the issues before them without the pressure of having to meet deadlines. If we accept these goals as the foundations for our premarital counseling, we must then deal with several important yet difficult issues. The first and possibly the most difficult is deciding whether we should marry a couple whom we believe is not ready for marriage. It is my deeply held conviction that a minister has the responsibility to withhold the decision to marry a couple until he/she is assured in his/her own mind that the marriage has a chance of making it. It is also essential that we make this clear to the couple when we begin counseling them. ​It is should become necessary to delay a couple from marriage, the minister must be willing to continue working with the couple either directly or through referral until the couple is ready to be married or decided to postpone or cancel the marriage plans. or she felt as if their child was in charge in explosive, highly-charged, emotional situations. Character development is at stake in these situations and much wisdom is needed. Human nature presses one to be in control, whether the individual be child or adult. Though all of humankind remains in a continual state of becoming mature, a child possesses very limited amounts of maturity and cannot be left in charge of the parent/child relationship. Children do not possess the ability to process their emotions without proper guidance from parents and significant others. Children must be taught how to use their experiences and subsequent emotions in constructive, positive ways rather than in controlling, negative ways. Our ability to help children in this area is largely dependent on how well we ourselves model healthy behavior patterns in regard to our own emotions. Therefore, it is extremely important to reflect on our own behaviors. Children should be allowed to express their emotions, but proper parental authority will not let the child abuse others by his or her words, attitudes and actions. Respect for others must be taught, and it primarily begins when parents teach their children to respect them as authority figures; not allowing them to abuse them with fits of rage and backtalk. Sure…all parents are going to experience this to some degree, but the child’s character is corrected and formed when he or she experiences the consequences of disrespecting others in attempts to control. Children engage in varous behaviors that often put them in charge. Some are as follows: whining and complaining, talking, yelling or interrupting when a parent is on the phone, not doing something they said they would do, name calling, borrowing things without asking, not putting things away after they have borrowed them, being late and of course, the aforementioned habit of talking back or showing disrespect. 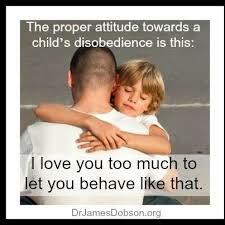 The tired, stressed or depressed parent is tempted to cave in and not correct the child in this type of behavior dysfunction. It takes time and effort to respond in ways that develop the child’s character for the good of themselves and their future place in society. The parent empowers their child and regains parental authority when he or she teaches that child self-control and the need to esteem others above themselves (Philippians 2:3). It is imperative for children to learn that the goal in life is to love and empower others in healthy ways, rather than attaining power to “be in charge”.